Whaler 923 is a spacious 2-bedroom, 2-bath ocean view condominium located on the popular courtyard side of Tower I. It’s 9th floor corner location offers expansive views stretching from the West Maui Mountains, across the resort courtyard and out to Kaanapali Beach. 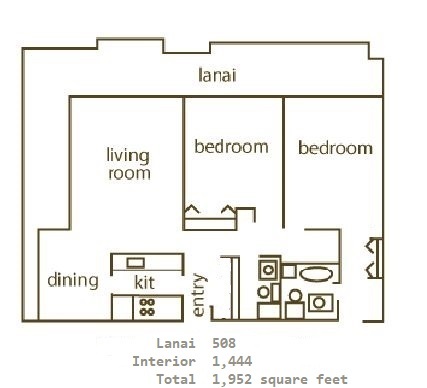 The lanai wraps around two sides of the entire condo. The unit has been renovated with custom top of the line appliances. The kitchen and bathrooms are beautifully redone with granite features. King bed in master, 2 Queen beds in the second bedroom, and a Queen sofa sleeper in living room to comfortably sleep 6 people. * This condominium has a washer/dryer. * SubZero refrigerator Please NOTE must wait 3-5 minutes before re-opening! Suction is strong while equalizing temperature. Great views; great condo with very nice furnishings and very comfortable beds. Very nice bathroom showers. One of the best condos we have been at the Whaler! This condo is highly recommended. Our stay at The Whaler could not have been better. I traveled with my 86 year old mom and three sisters. When we arrived, Nathan brought up our bags and was so helpful and even sent up a bottle of champagne when we told him that my dad had passed away and we would be celebrating his birthday at his favorite travel spot. The condo did not disappoint and the online pics did not do justice to not only the ocean views, but the gorgeous mountain views. The location was perfect with just a short walk to the ABC store, Whaler's Village, and delicious restaurants. When we were checking out the staff gave us a private hula lesson with Nathan singing and playing the Ukulele. It was the best ending to our trip. Would definitely return and rent this unit again! Awesome property- stayed in different places at Whaler- this unit did not disappoint! Two bedroom was perfect and the views of the mountains in the morning may have been better than the ocean view- unbelievably beautiful! Great that is an end unit with wrap around deck- sunsets were also great. Nice to walk to my favorite restaurant- Hula Grill- great location. Also clean and up to date- very nice.